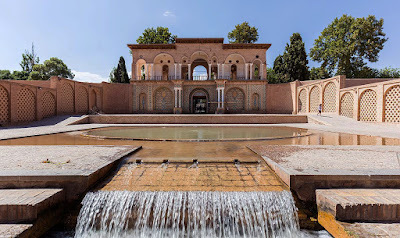 Shazde or Prince Garden, one of the most outstanding examples of Persian historical garden, was originally built under the order of the governor of Kerman, during the late Qajar Period. Its location, near Mahan, was selected strategically as it was placed on the route between Bam Citadel and Kerman. The garden’s traditional edifice was embellished with small brooks rushing between green and gigantic trees. The presence of fertile soil, gentle sunshine, mild breeze and most importantly qanats (chain water ditches under the ground), miraculously, has provided the possibility of creating a grassy garden in such a dry area. Shazdeh Garden was registered by the UNESCO as a World Heritage Site under the name of the Persian Garden in 2011.